In a Nutshell: Since 2008, Certify has grown from a single-use receipt-capture app built for iPhone 3G into the largest independent travel and expense management company in the world. Companies in over 100 countries use tailored Certify solutions to streamline business processes, deepen insight, and manage spend more intentionally. For on-the-road employees as well as managers and admins back in the office, the old-school way of doing expense reporting is a huge chore. Among a hundred other things, traveling employees must remember to save their paper receipts, compile their purchases in something like a spreadsheet, and wait to get their money back if they’re using their own card. Back in the accounting department, everything must be looked over piece by piece, with data entry and reimbursement requiring cumbersome manual processes. And if there’s anything beneficial to be learned about how employees are spending the company’s money, there’s no way to tell that doesn’t require a lot of extra work. That’s the reality Certify stepped into in 2008 when it built the first-ever mobile receipt capture app. As CEO Bob Neveu puts it, the company focused on solving one big problem in the most straightforward way possible. Certify CEO Bob Neveu told us how the company evolved from a simple receipt-capture app to the largest independent travel and expense management company in the world. From there, Certify listened to its customers’ feedback and built functionality for feeding expense data directly into office accounting platforms and connecting employee credit cards to the system. Today, Certify is a fully featured core expense management platform that makes life on the road easier for employees and lets teams back home understand, report, and bring efficiencies to travel spending. And it works all over the world. Taking on an international client in 2010, Certify began to build in global functionality. The platform supports 64 languages and over 140 currencies. “That includes character-based languages like Japanese, Cantonese, and Mandarin, and even languages like Hebrew that read right to left,” Neveu said. Certify serves the full gamut of clients, from startups and other small businesses to established mid-sized firms and the largest global enterprises. For businesses with fewer than 25 employees, Certify Now! includes ReceiptParse® for mobile receipt scan and autofill, ReportExecutive™ for auto-generation of expense reports, and even a location-based mileage calculator. For firms with between 25 and 200 employees, Certify Professional includes all the features of Certify Now! plus integration for personal and corporate credit cards and accounts payable feeds for posting expenses. Certify Enterprise additionally integrates leading HR-management and enterprise resource-planning platforms. Moving up the chain, Certify compliance and reporting features help transform expense accounting into expense management. When employees are using company credit on the road, companies want the ability to discern their spending patterns, ensure compliance, identify preferred vendors, and more. A global view of what traveling employees are expensing reveals opportunities to make spend serve overall business goals, not the other way around. As customers drove Certify’s buildout of its core platform, the company tacked on additional services such as modules for ACH payments, travel booking, invoice management, and purchasing. Certify Payments reimburses employees and vendors across multiple banks and borders. Certify Travel finds the best travel rates or can even function as an integration engine for a firm’s preferred travel management partner. Neveu said there’s often a progression in adopting the Certify portfolio. 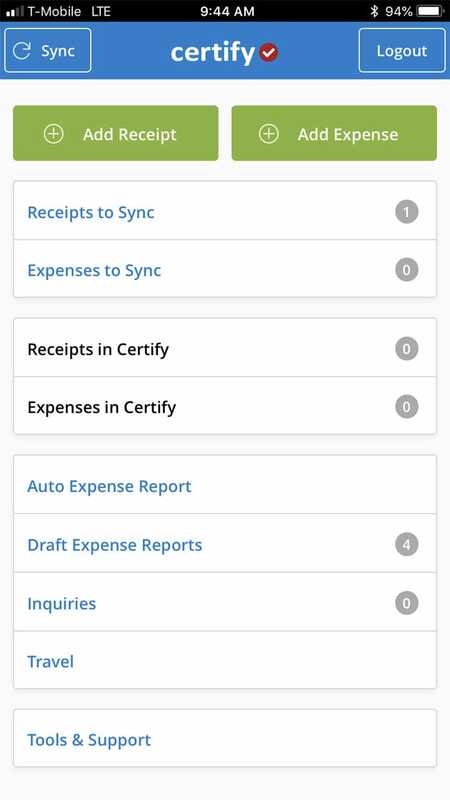 Moving deeper into the suite, Certify Invoice uses ReceiptParse to capture invoice information, check invoices for compliance, and pay them. “Our Invoice product has become really, really popular in the 100-employee-and-up range,” Neveu said. 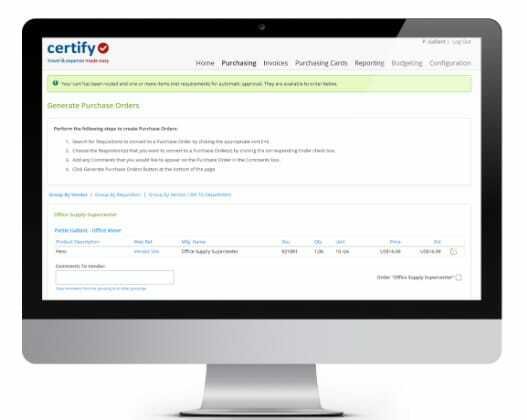 The just-launched Certify Purchasing module handles transactions going in the other direction. “So we can go from a very simple expense report solution all the way into accounts payable, purchase orders, and global payments,” Neveu said. And with all that data captured, everything is actionable. Meanwhile, Certify has also diversified through acquisition. In 2017, it joined the private equity firm K1, which had already acquired a few of Certify’s competitors. “Part of the deal was that they would also turn over management of those platforms to Certify — so we became a multi-brand company,” Neveu said. The combined firm has continued to acquire, purchasing Abacus to add real-time expense reporting to its portfolio and Captio to increase its European footprint. This past March, Certify joined with enterprise expense management provider Chrome River Technologies in a transaction valued at over $1 billion. “We’re now the largest independent travel and expense management company in the world,” Neveu said. The combined Certify entities serve more than 10,000 customers, including some of the world’s largest enterprises. As the company has grown, the brand has remained customer-focused. It generally counsels new clients to start slowly onboarding its solutions. “We tell them, don’t upset everything overnight. Just change a small part, get everybody adopted on that, then add more functionality as needed,” Neveu said. Regardless of what a customer chooses, companies can be sure they’ll receive a rollout and service experience tailored with their success in mind. With every customer doing things a little bit differently, Certify delivers not just an “on switch” but a unique consultation in accordance with the company’s long-standing dedication to customer happiness and success. And the company will have even more to offer soon because Certify remains on an aggressive growth trajectory. “We’re going to continue to grow our business both organically and inorganically and bring on new features and functionality our customers are asking for,” Neveu said. That means companies everywhere will have even more reason to join the thousands that have already chosen Certify to transform how they manage corporate travel, payments, and purchasing.